The thrill ride that was the Roaring Twenties came to a screeching halt in October 1929, when the Stock Market crashed and America was thrust into the Great Depression. Out of this catastrophe emerged a president whose social, economic, and political reforms would leave a legacy of programs and ideas that continue to have an impact today. Defining Moments: The Great Depression and the New Deal presents an authoritative account of the origins and progression of the Great Depression and the New Deal. It also explores the era’s lasting impact on America’s political and cultural landscape. The volume is organized into three distinct sections—Narrative Overview, Biographies, and Primary Sources—which offer a one-stop resource for student research. Other notable features include a glossary of important people, places, and terms; a detailed chronology featuring page references to relevant sections of the narrative; an annotated listing of selected sources for further study; an extensive general bibliography; and a subject index. 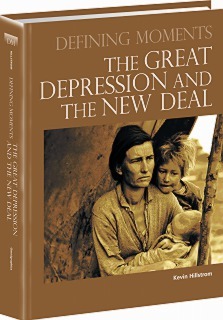 "The Great Depression and the New Deal is a well-organized, balanced, and approachable reference source for its intended audience, undoubtedly reflective of the composition of the series advisory board (public and school librarians and educators)." "Useful for those seeking a basic or starter overview of events in U.S. history, the volumes from this series are recommended for high school and public libraries."